There are many peices of equipment and instrutments that a podiatrist and chiropodist use. Some peices of equipment are common to all healthcare professionals, others are specific to podiatry and footcare. We will being building up this section of the podiatrist clinic website to include descriptions, uses and advice about all types of chiropody equipment and podiatry instrumentation. We will introduce new advances in podiatry instrumentation when such products become available on the market. We will also highlight issues, benefits and disadvantages surrounding various types of podiatric instruments. Equipment and footcare supplies for podiatry patients includes orthoses, in-soles, footbeds, footwear, walking poles. Supplies for many healthcare professionals include dressings, gloves, aprons, anti-bacterial hand gel, tubeqauze applicator. Does Laser Treatment Cure Onychomycosis? The PinPointe Footlaser is advertised as new laser technology that treats toenail fungus. Developed in the USA and currently available via six providers in the UK, the big questions are how does it work and is it effective? "The laser light passes through the toenail without causing damage to the nail or the surrounding skin. At the time of the procedure, the toenail will not become instantly clear— it takes time to grow out." This explanation does appear to be somewhat lacking in detail. So what about the answer to the question is it effective? There are no references to any peer re-viewed journal articles about any clinical studies, although there are provider and patient testimonies. 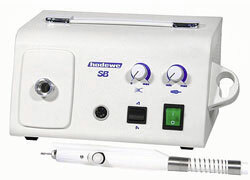 The treatment for onychomycosis using the PinPointe Footlaser is described as being for cosmetic purposes only and patients are required to pay around US$1000 per treatment. The equipment is promoted to podiatrists as being a money spinner. Does the PinPointe Footlaser really treat onychomycosis or is just a gimmick? Naturally there has been much debate on this topic within the podiatry community. Onychomycosis (toenail fungus) is an infection that can discolour, weaken, crack, destroy and abnormally thicken toenails. Toenail fungus afflicts an estimated 900 million people worldwide. Patients suffering from Onychomycosis are typically treated using an orally administered drug, e.g. itraconazole, and it has been recently reported that antifungal socks can help prevent recurrence. So is there a need for an expensive laser treatment at all? One of the UK providers is The Dow Clinic in Newcastle Upon Tyne. In a post on the Podiatry Arena forum he provides a little more information than is available on the PinPointe website. "[The PinPointe Footlaser] is a serious technological variety of medical laser set to operate at 4 watts using a single beam width, fired in measured pulses to target the sensitivity range of the pathogens involved in mycotic nail infections, using a specified treatment protocol. More in depth technical details are proprietary and therefore kept by the company. ... It is designed to penetrate both nail and soft tissue without damage to host tissue but harmful to the range of pathogens involved; Viral, bacterial, mould and fungal. The treatment is mainly without discomfort and has no systemic side effects reported at all." Whether or not laser treatment for onychomycosis will become accepted by the podiatry community remains to be seen. A published, peer-reviewed clinical trial would be beneficial in proving the effectiveness of the Footlaser. Multiple-Use Equipment or Disposable Instruments? When considering purchasing podiatry instruments should you chose multiple-use or disposable podiatry instruments? 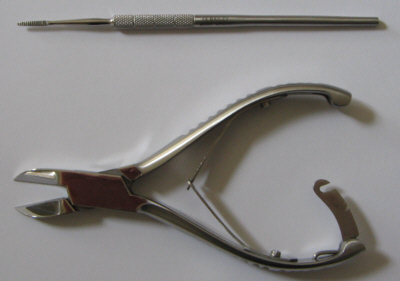 Traditionally medical instruments such as scapels, mosquito forceps, scissors, nail files, probes etc. were too expensive to be disposable. Now that disposable medical and podiatry instruments are available what are the advantages and disadvantages of each? Multiple-use medical instruments are sterilised between each patient using an autoclave. Several sets of podiatry instruments are required due to the time taken for the autoclave to achieve thorough sterlisation. It is possible that instruments could be used on different patients without sterilising the instruments completely or only partially sterilising them. The autoclave machine and sets of podiatry instruments require initial capital expenditure and the autoclave requires energy to operate. Each set of podiatry instruments should be labelled and the set used on particular podiatry patient treatment should be recorded in the patient's notes. This is so that in the event of contamination, each podiatry patient who had been treated using the particular podiatric instruments can be traced. Multiple-use podiatry instruments can be of a high quality since their long lifetime will merit the higher expenditure. As with any tool or instrument, a higher quality tool with enable the operator to perform better quality work with less effort. It is now possible to purchase disposable chiropody equipment. These instruments are used once only and disposed of as contaminated sharps. Since the disposable intrsuments are only used once the main advantage of disposable instruments is that there is no chance of cross-infection of patients. In order to manufacture chiropdy instruments so cheaply that they are disposable, one might assume that the quality will be lower, making harder work for the chiropodist and increasing the likelihood of making an error or hemming the chiropody patient. In our opinion, based on the examples that we have used, the quality of disposalable instruments does appear to be lower than that of the multiple use equipment. However, it should be noted that disposable medical instruments must be manufactured under "ISO 13485 certification for Medical Devices" under EEC Directive and therefore are manufactured to the highest standard of medical instrument manufacture by skilled craftsman in their respected country. When any item is manufactured at low cost there are more likely to be issues relating to the pay and conditions of the workers. This could be the case for workers who make cheap disposable chiropody instruments. Another issue is whether or not disosable medical equipment is recycled? PHS, who provide a disposal service medical instruments, have been contacted about this issue. Hopefully we will receive a reply from them soon. Disposable chiropody instruments do not incur large initial capital expenditure and would therefore be particularly beneficial to anyone who is in the process of setting up a new medical or chiropody practice. There is also less time, hassle and energy spent since the disposable chiropody instruments do not have to be autoclaved nor does an identification number need to written in the patient notes.